The Star Wars footwear partnership between Disney / Lucasfilm and Po-Zu continues with the release of these sweet R2-D2 high tops! The Po-Zu Star Wars shoe collection was first introduced nearly two years ago, so it’s surprising that they’re only getting to R2-D2 now - but better late than never. Po-Zu is known for their high-end, ethically produced footwear, and these R2-D2 high tops are no exception. The sneakers are made with an organic cotton canvas upper, a coconut husk and natural latex FootMattress for comfort, and fair trade rubber soles. You can pre-order a pair right here for £69 ($91) with shipping slated for August. Po-Zu is based in London, but keep in mind that global shipping is free on orders of £75 / $100 US or more (you can toggle USD pricing at the top of the product pages). Otherwise DHL shipping in 1-3 working days runs around $13. "From the first time we saw him on the silver screen way back in 1977, R2-D2 has been among the most popular of all Star Wars characters. From his service in the Royal House of Naboo through wars and adventures alongside C-3PO, R2-D2 has proven to be a loyal and trusted friend to many of the galaxy’s greatest heroes. 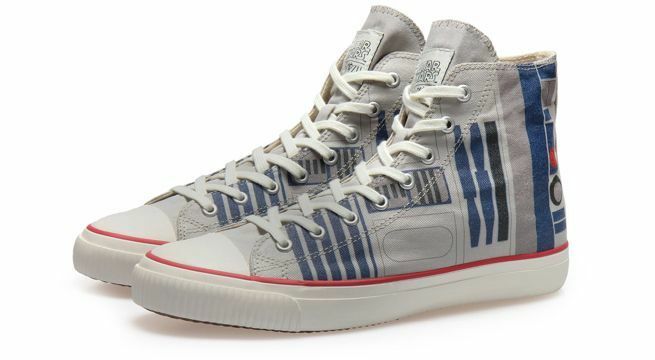 Now you can roll like the galaxy’s favourite astromech with our new R2-D2 high top sneakers." You can shop Po-Zu's entire lineup of Star Wars footwear right here. Inside you'll find footwear inspired by Rey, Finn, Poe, Chewbacca, BB-8, Porgs, and more. However, one of our favorite new styles is the recently released Han Solo sneaker. 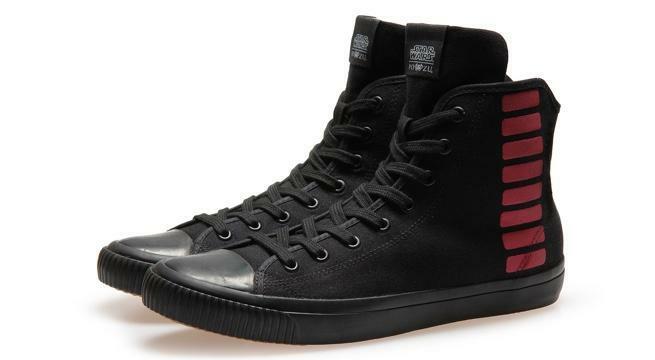 Again, the design for Po-Zu's Han Solo sneaker is super simple, but the Corellian Bloodstripe along the side is all it takes to make the connection. Plus, you’re getting a shoe that’s extremely well crafted with sustainable materials and environmentally friendly production processes. The Han Solo sneaker is available to order right here in men's sizes for £69 / $91.